Walrus female and pup on an ice floe in the Chukchi Sea. Today’s challenge seeks to protect walruses from suffering potential serious harm and harassment at the hands of companies like Shell Oil, which crashed and burned during its Arctic Ocean drilling efforts in 2012. A coalition of conservation organizations filed a lawsuit against the U.S. Fish and Wildlife Service today, challenging a rule that permits oil companies, like Shell Oil, to harm Pacific walruses during Arctic Ocean oil drilling beginning as early as next year in key walrus feeding areas. 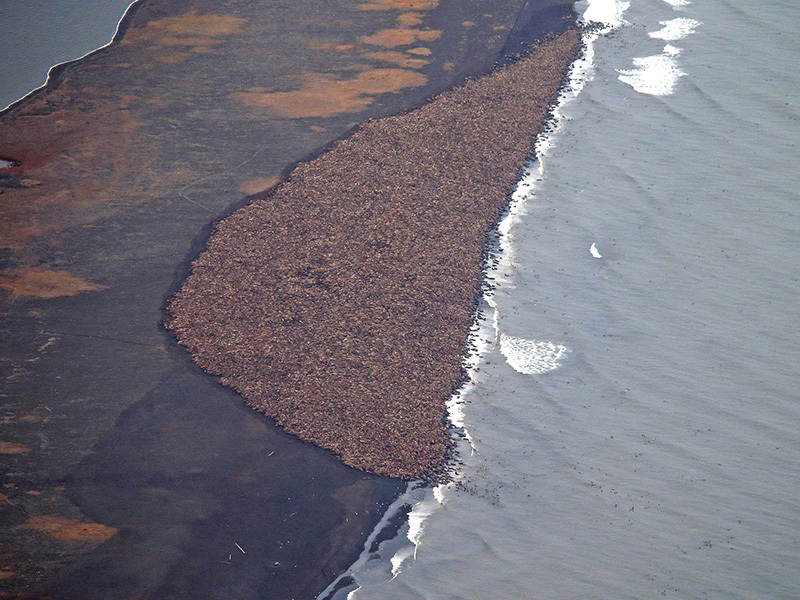 Approximately 35,000 walruses gather on the northwest coast of Alaska, near Point Lay, on Sept. 27, 2014. The Arctic Ocean’s sea ice is rapidly melting due to climate change, creating dire consequences for Chukchi Sea walruses which depend on the ice for resting, raising their young, feeding, and avoiding predators. As a result of this melting, the walruses have been forced ashore in recent years. This year it happened again as 35,000 walruses crowded together on the Alaskan Arctic coast just a few weeks ago. Walruses must swim distances up to 100 miles from these coastal haulout areas to reach Chukchi feeding grounds to find the clams and other bottom species they need to survive. They are vulnerable to stampedes and trampling when forced to use coastal resting areas. The U.S. Fish and Wildlife rule puts these already at risk mammals directly in harm’s way by allowing risky oil company operations in key walrus foraging areas in the Chukchi Sea. This rule is being challenged by Earthjustice on behalf of Alaska Wilderness League, Center for Biological Diversity, Greenpeace, Resisting Environmental Destruction on Indigenous Lands, Sierra Club and by the Natural Resources Defense Council. The Fish and Wildlife Service adopted this regulation, which allows for “the incidental take of walruses in connection with oil and gas activities,” even though the agency acknowledged that walruses could be affected adversely in large numbers in crucial habitat areas like the Hanna Shoal. Shell Oil intends to drill under this government rule as early as 2015. The company was investigated and fined after multiple missteps and close calls during its efforts to drill in the Arctic Ocean in 2012, only to call its work in the region a success. Oil operations have the potential to chase walruses away from food-rich foraging areas, trigger stampedes, and harm the animals with deafeningly loud seismic blasts. Drilling risks catastrophic oil spills that could not be cleaned up in Arctic conditions. The September minimum sea-ice extent reached a new record low in 2012, encompassing only about half the area it covered on average from 1981–2010. In 2014, the sea ice shrank to 5.02 million square kilometers (1.94 million square miles), the sixth-lowest extent of the satellite record. “The last thing Arctic walruses need is dirty drilling in the middle of their most important habitat. It’s time for oil companies to stop sticking their drills where they don’t belong, and it’s up to the U.S. Fish and Wildlife Service to lay down the law,” said Rebecca Noblin of the Center for Biological Diversity. “Shell is putting the Arctic walrus in double jeopardy. Their world is melting because of oil companies’ greedy thirst for more fossil fuels, and now their home will could be under imminent threat from a Shell spill. The Obama administration needs to put sane regulations in place that protect this sensitive species,” said Greenpeace Arctic Campaign Specialist John Deans. “Walruses already are under great stress from climate change. This rule would allow oil drillers to risk further harm to the species without proper analysis and mitigation. The risks are too great—if drilling resulted in an oil spill, there would be no way to clean or contain it, and the consequences could be catastrophic,” said Robert Thompson of REDOIL. "The danger to walrus is one more in a long list of serious risks posed by drilling in the Arctic Ocean," said Dan Ritzman, Alaska program director for the Sierra Club's Our Wild America campaign. "We should not sacrifice the Arctic's amazing wildlife, the subsistence culture that depends on it, or our climate to dirty drilling. The effects on walrus and other wildlife will only worsen if we don't begin keeping dirty fuels in the ground."